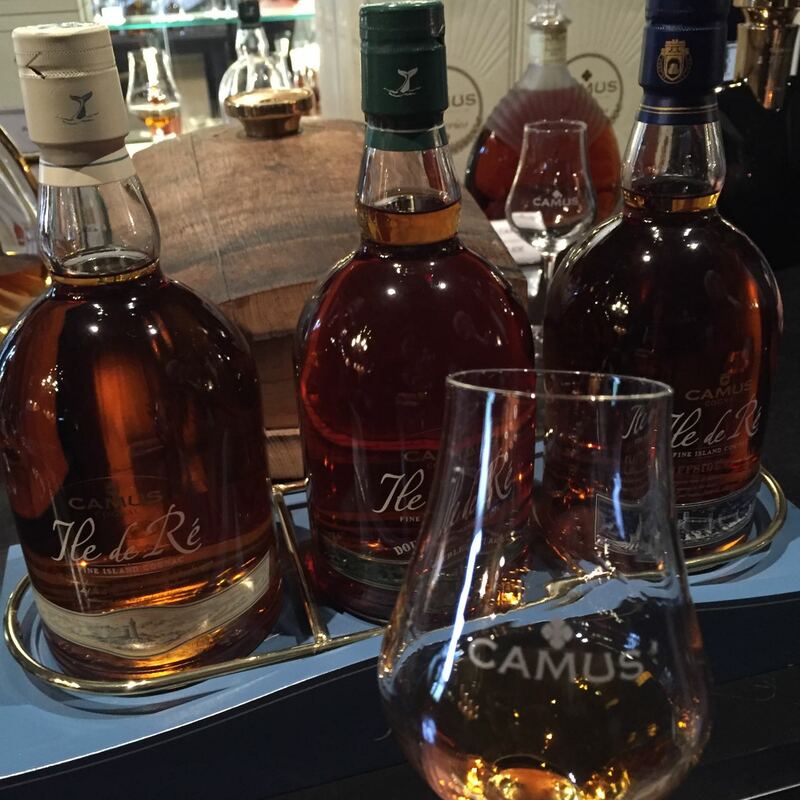 It was in May of this year when I had the chance of visiting the house of Camus Cognac, along with a group of my friends. 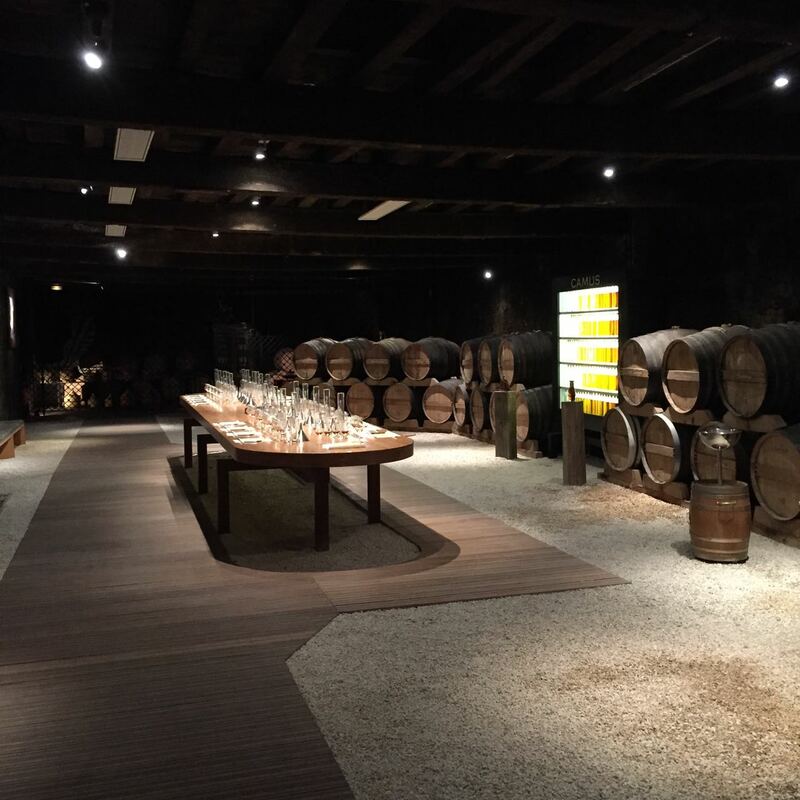 We arrived at the location – Rue Margerite in Cognac, and were feeling pretty honored to be able to take advantage of this special tour, the Camus Master Class. We were met by Sylvie Perret who was very charming – Sylvie started the tour in the courtyard of a wonderful old Charantais building. 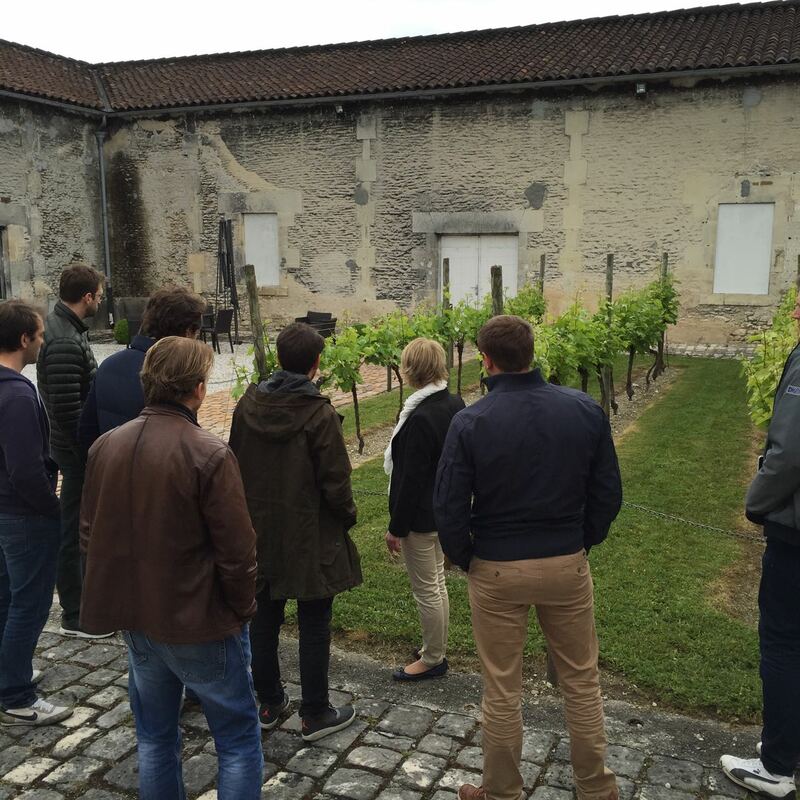 And within this courtyard was a mini vineyard where Sylvie showed us different types of grapes that are used to make cognac. From here we entered what I can only describe as a dark, snake-like corridor. 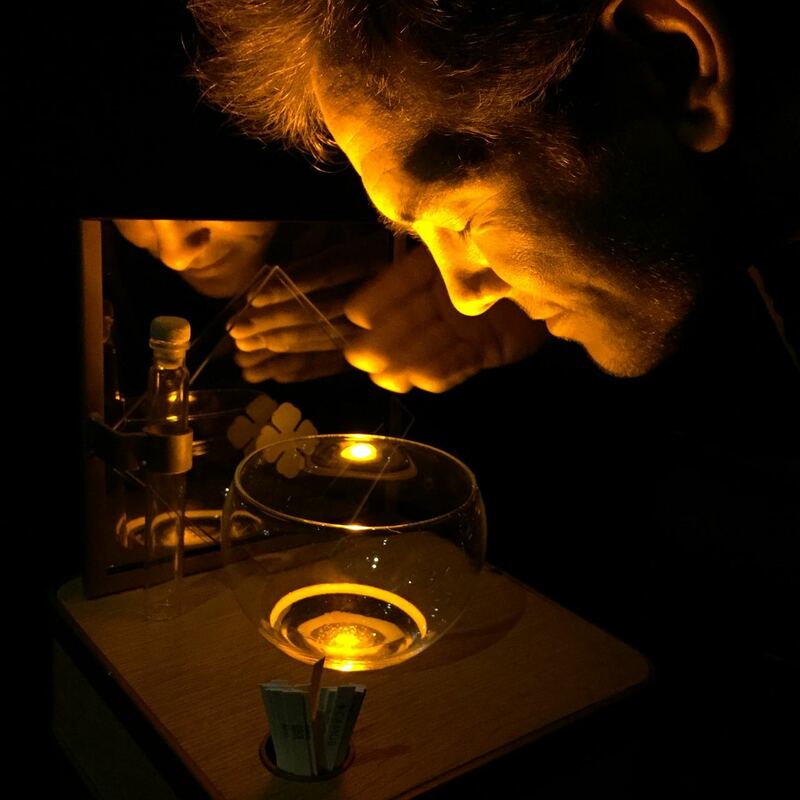 It was cool inside out of the sun, and we moved forward to be shown a display of soils. 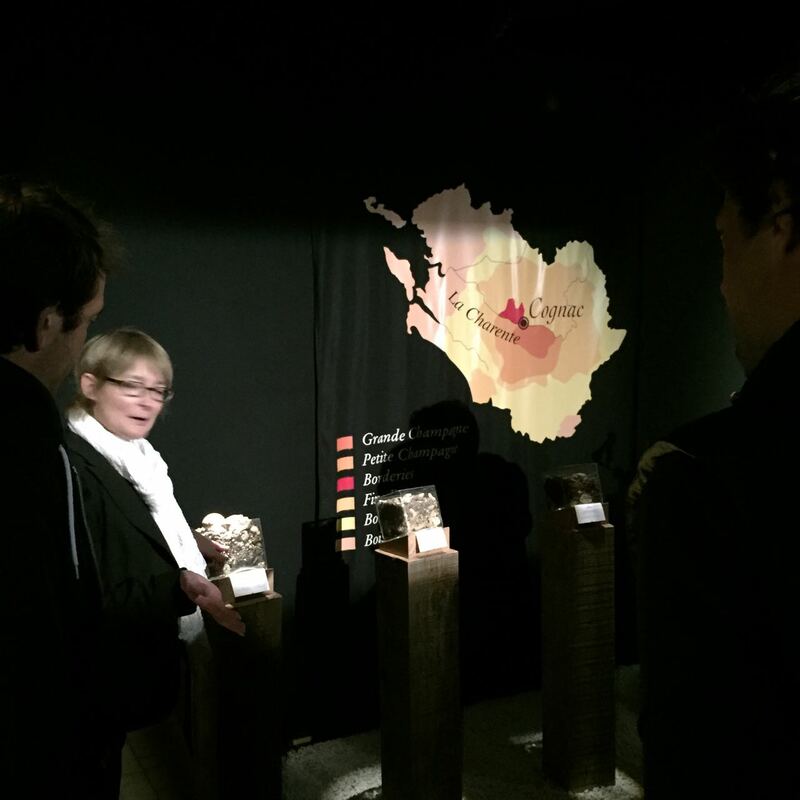 Sylvie explained about the different terroirs of Cognac, and how the qualities of the soil in each is so crucial for the grapes that grow here. 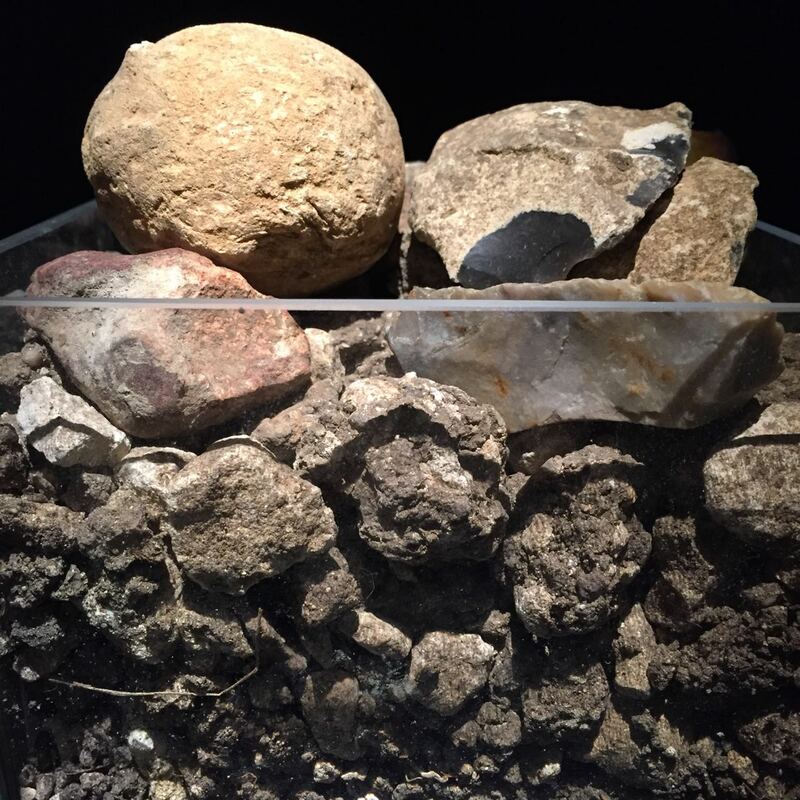 It was great to see the soils in such context, and really showed up the chalkiness of the Grande Champagne terroir (photo above is Grande Champagne). Moving along in the semi-darkness (a feature that really enhanced all your other senses, particularly that of smell), the next stop was by a pot still. Usually this is where Sylvie would explain in detail the distillation process. But as we were all pretty au fait with this, we only had a brief chat. 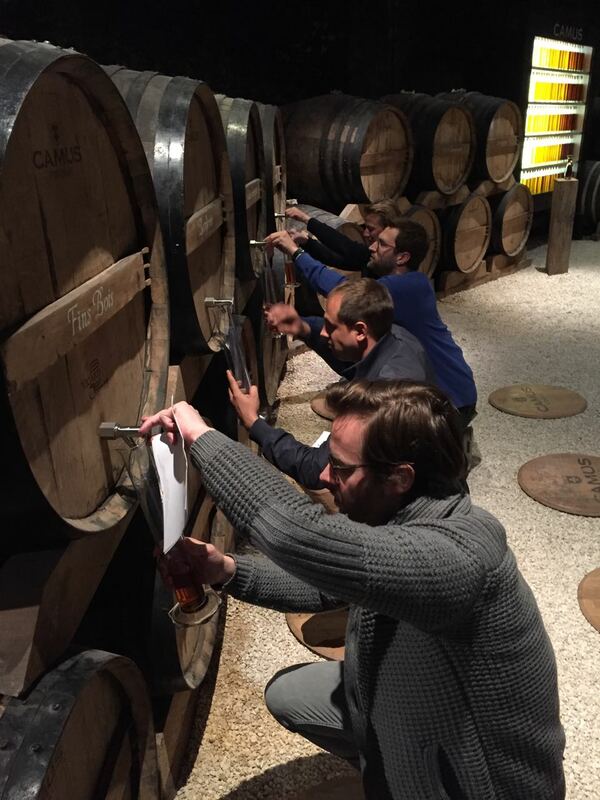 So we moved onto the next stage, which was the actual barrels used to age the cognac. This was really interesting to see, and in addition we learnt more about the Camus Dark and Intense Cognac. This has to be the product with the most solid USP of Camus Cognac right now. It’s a product that’s allowed to mature in the barrel, before being removed, the barrel ‘re-toasted’, and the cognac being put back inside to further mature. It’s an interesting concept and one that’s been a big success for the company. Next stop was a trip along the Camus memory lane. It was a gallery of portraits of all of the previous Cellar Master’s of the house. 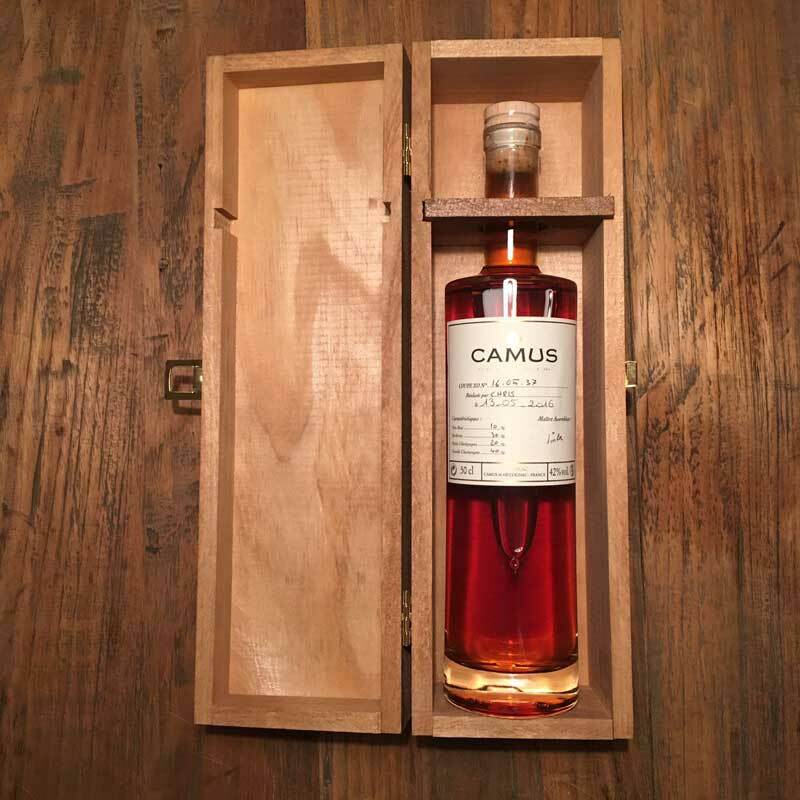 It was pretty amazing – and really brought home the success of Camus, which is the 5th largest of all the cognac houses, and is still wholly family owned and run – quite incredible, to be honest. Standing in front of the images of each generation of the Camus family, Sylvie explained the mark that each one had left on the company. For instance, who was responsible for pumping up the level of production; who brought about international licensing. And today’s head, Cyril Camus, who has opened up sales into China and the whole of Asia. We continued walking through the sense-evoking darkness to arrive at a table that was most pleasing to the eye. Lit around the perimeter with incandescent blue lights, the table was filled with different Camus Cognacs lined up in order of age and value. I loved this – it really appealed to my sense of orderliness – and was a wonderful visual display. 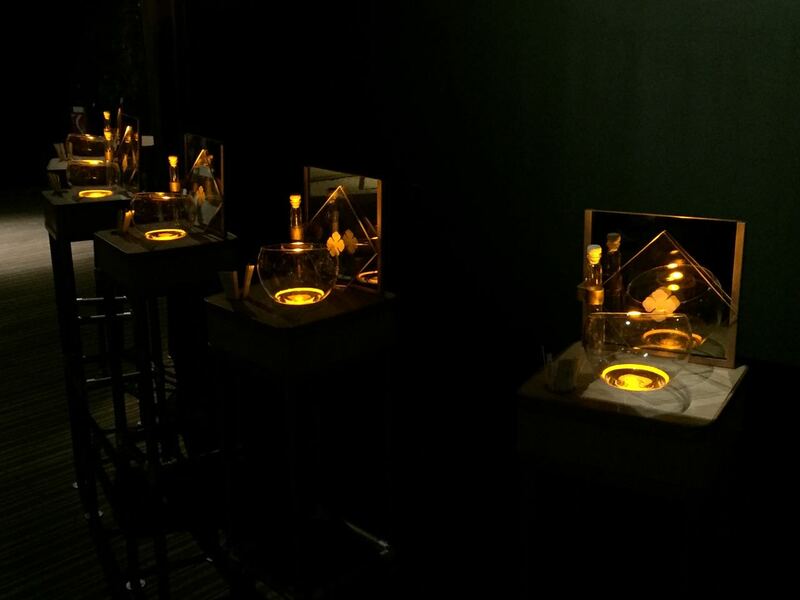 This mingled with the unique smell of the cognacs – it was almost a sensory overload! We lingered here for around 30-40 minutes, discussing the different cognacs with Sylvie. On a regular tour this section would probably take a bit longer, but as I’m familiar with pretty much all of Camus’s products, we didn’t need to dally too long. Our next steps took us into a light, airy room – a real contrast after the time spent in the darkness. 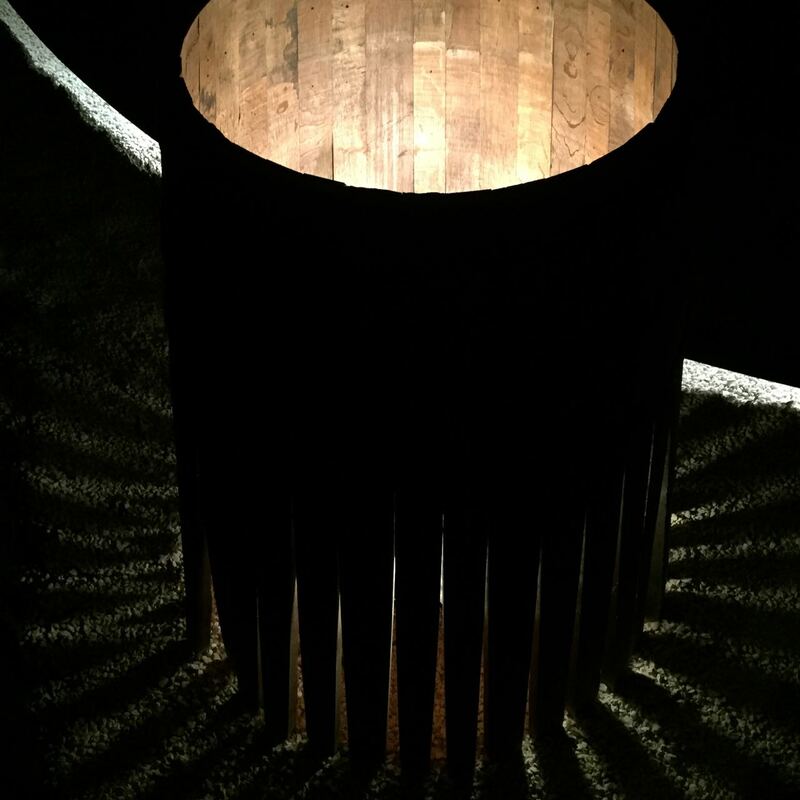 To me this symbolized the transition from dark to light – in other words, when the eaux-de-vie has finished aging in the gloom and once again sees the light of day to become a cognac. It was this room where we were going to create our own blend of cognac. 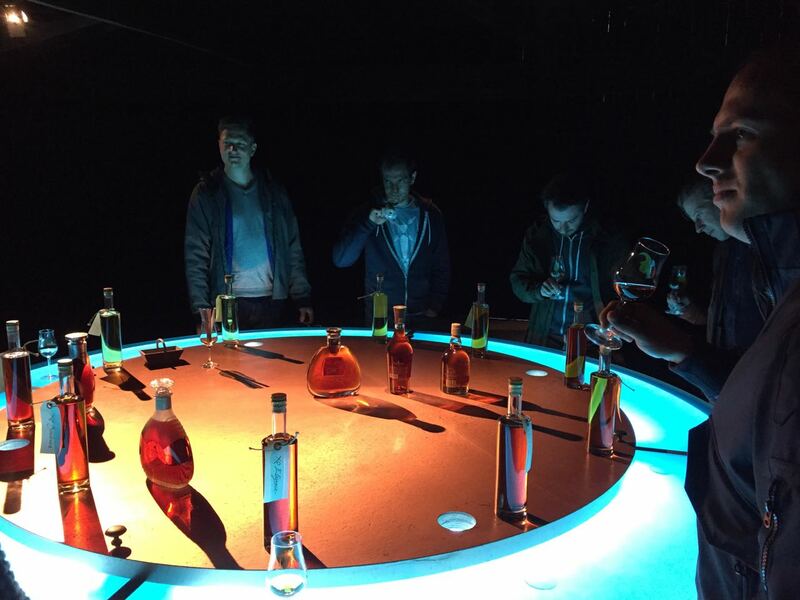 (You might remember that we did this once before, at the HQ of Hennessy). 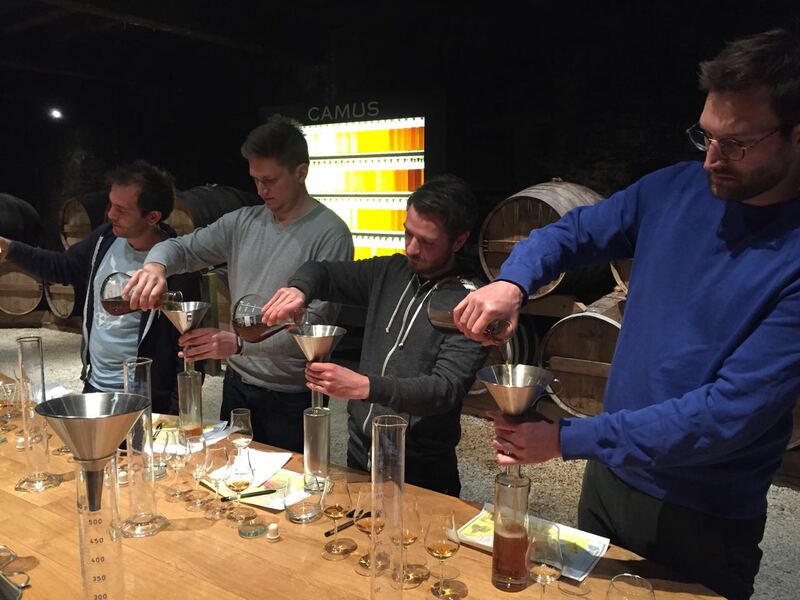 The Camus blending experience was somewhat different to that. 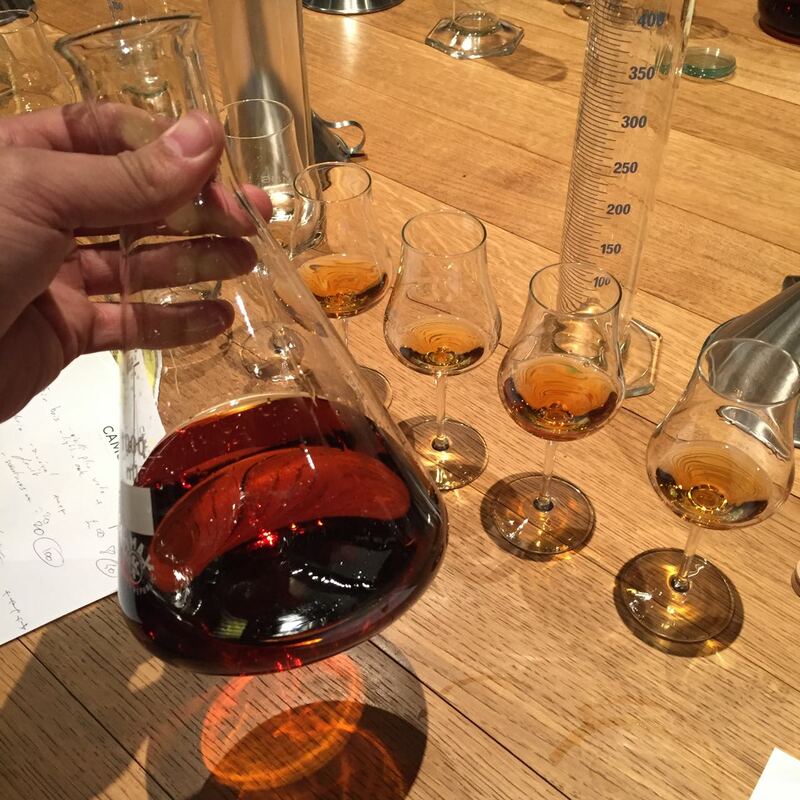 We didn’t get to blend different vintages (years) of cognac, but instead we mixed different crus. 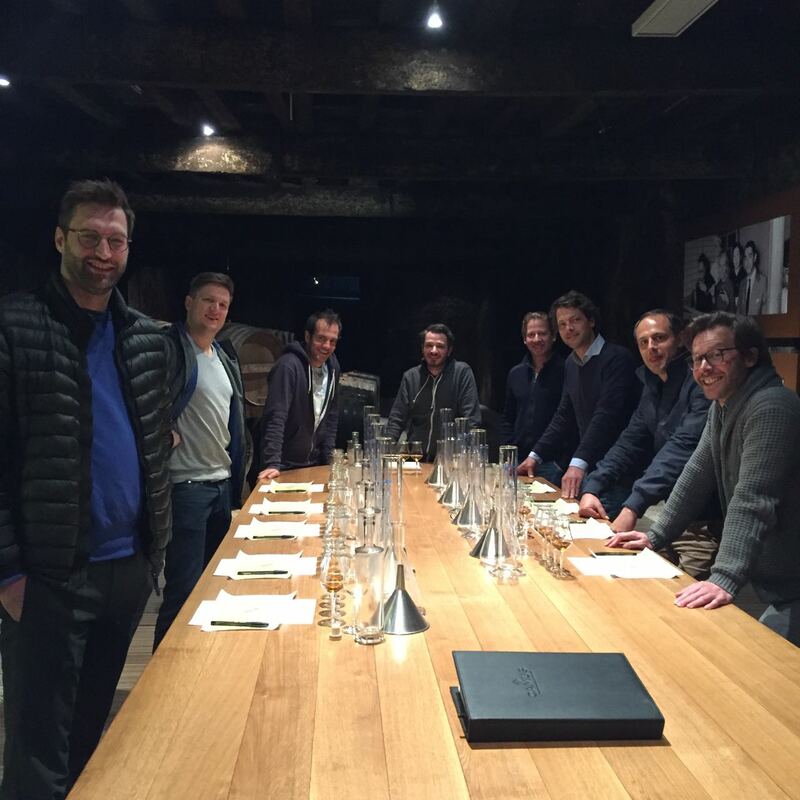 We got to taste cognacs from Borderies, Grande Champagne, Petite Champagne, and Fins Bois etc., and then you chose which quantity you’d like to include in your blend. 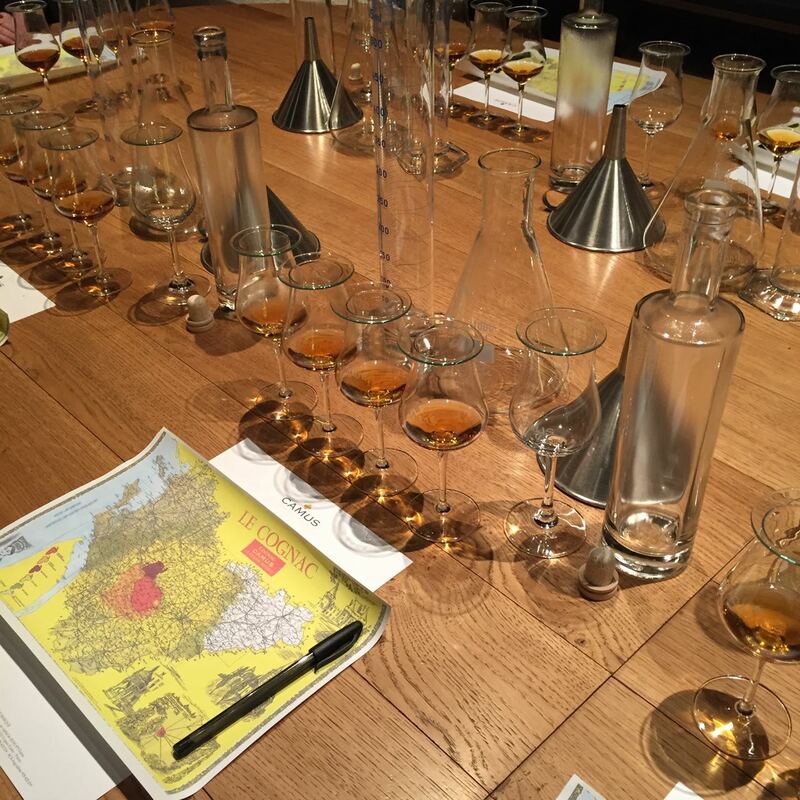 We had all the equipment necessary to do this – from the perfect tulip glasses with which to taste, our big test tube to measure out quantities, and a personal bottle into which our finished blend of cognac would be sealed. Once we’d sniffed, sipped, and decided on the crus we’d like to use, we then had to choose the ratios. You then went to the various barrels and measured out the amount needed. Our bottles were then personalized with labels and sealed, and we got to sign our own bottle. Sylvie advised us to leave the bottle for at least 3 months before opening. This would allow the molecules time to combine and converge. I haven’t yet opened mine – but I’m pretty sure my friends have! Our tour finished in the shop where we tasted some other Camus Cognacs. We enjoyed the Ile de Re selection, and one of my friends was really interested in the Camus Dark and Intense. 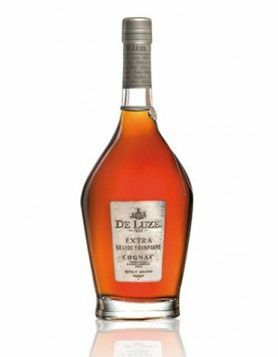 So we all had a try – a great Extra Cognac. I personally think this is a really great cognac. It’s been well marketed, and the decanter is solid and well crafted. It’s clever really, because the bottle is black. Read more about Dark & Intense in our online shop. Personally I think this works, because Camus Dark and Intense is an older cognac. Because of the color of the bottle you can’t see the liquid inside – you only see it when it’s poured into a glass. 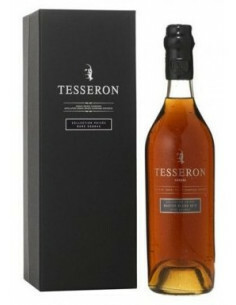 With an older cognac such as this, it’s fine (you know, one with a value of perhaps more than $450 or so). With a younger cognac (say one worth less than $50), it’s important to be able to see the color of the cognac in the bottle. Other products that have used this concept include Hennessy Black and De Luze A. (Alfred) de Luze. 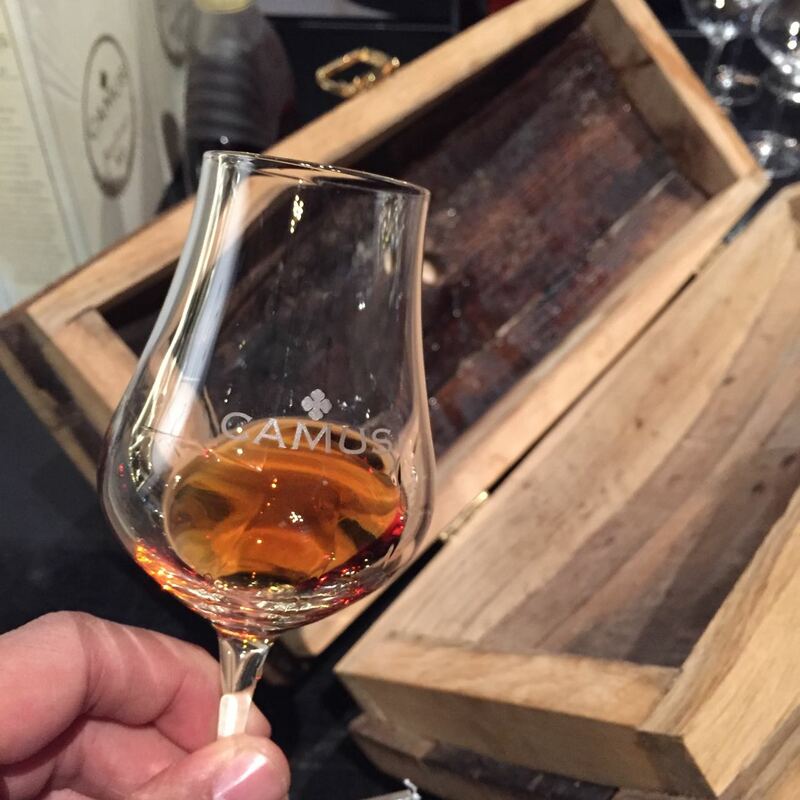 So – what is my overall impression of our visit to Camus Cognac? Well, I have to say that we all really enjoyed it. 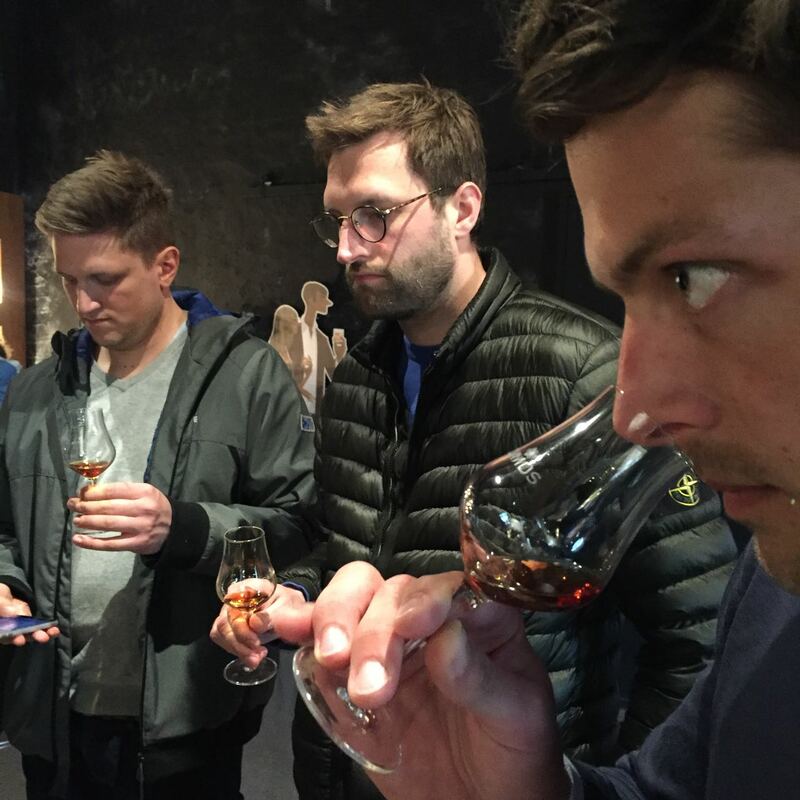 The visit was professional, unpretentious, informative, and personal – the cognac blending has a really nice touch. It means you get to go home with a really cool souvenir, your very own bottle of cognac. 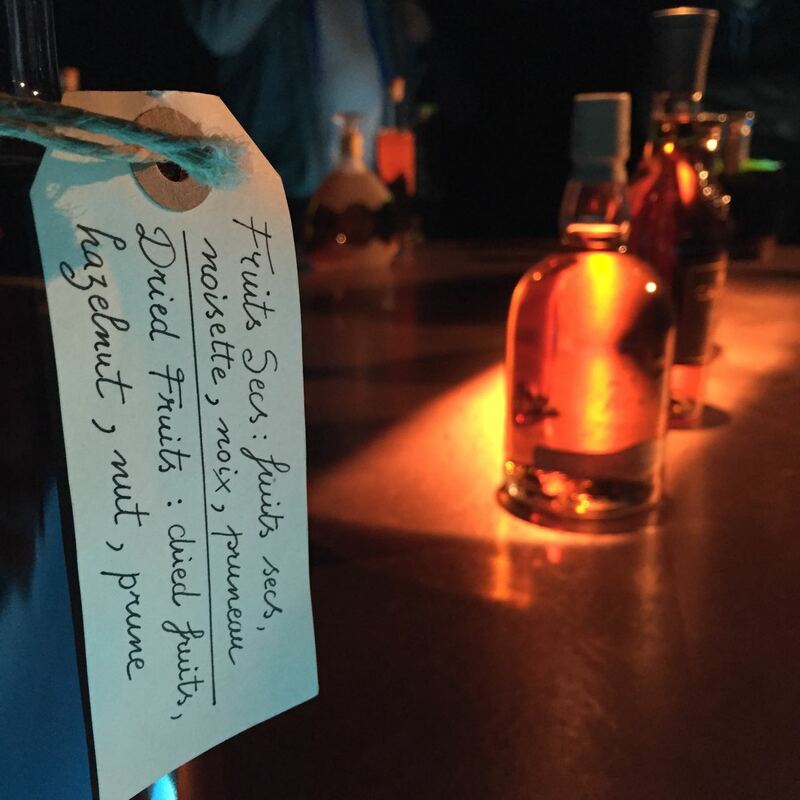 We took home not only a physical bottle of cognac, but also some really special memories. This is the first time I’ve done such a tour and blending experience with friends, and it was great. We really got the concept of learning every stage of cognac production, and what an important part the soil plays in the process. That’s the one thing that was made very much apparent – it’s where it all starts – the soil. Such a tour is also great marketing by Camus. By taking away a bottle of your own blend of cognac, when you open it a few months later, once again this reiterates the brand in your mind. 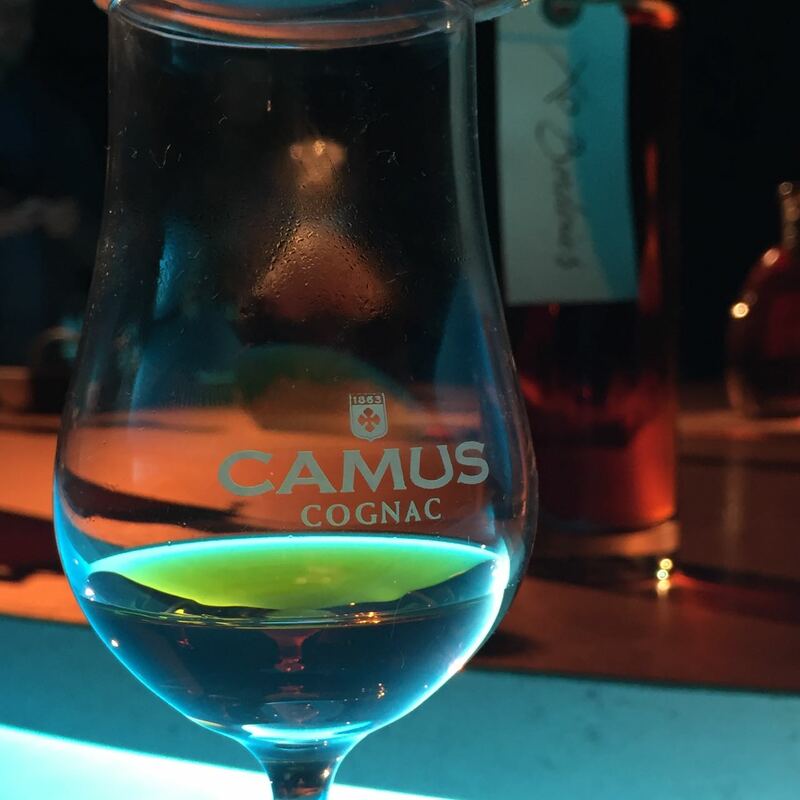 And let’s face it, it’s pretty special to have a bottle of truly unique cognac that you created yourself. 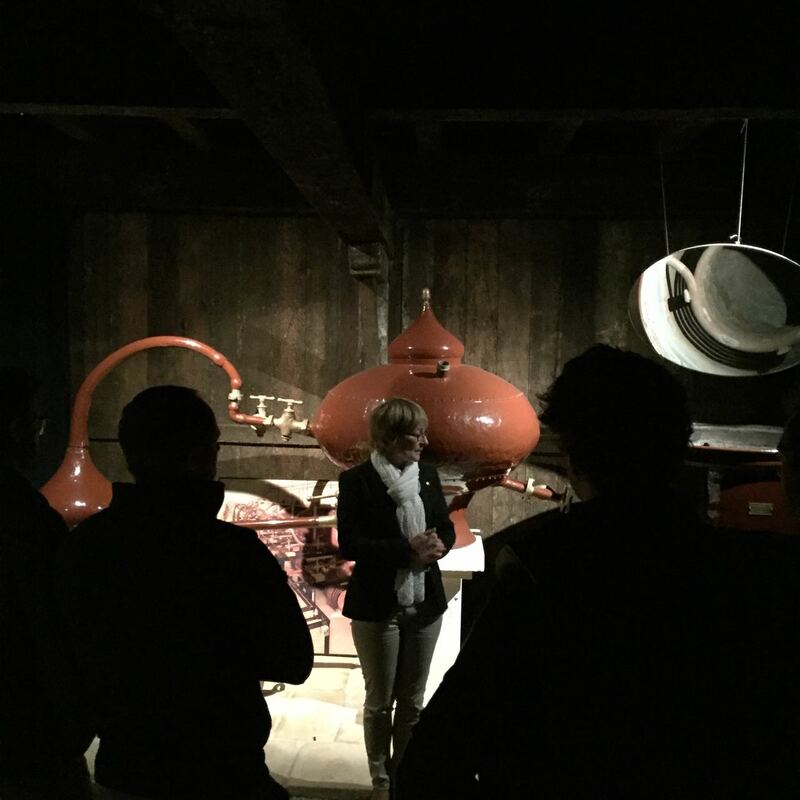 We’d like to extend a hearty thank you to Camus Cognac, and to Sylvie for guiding us on this wonderful tour. 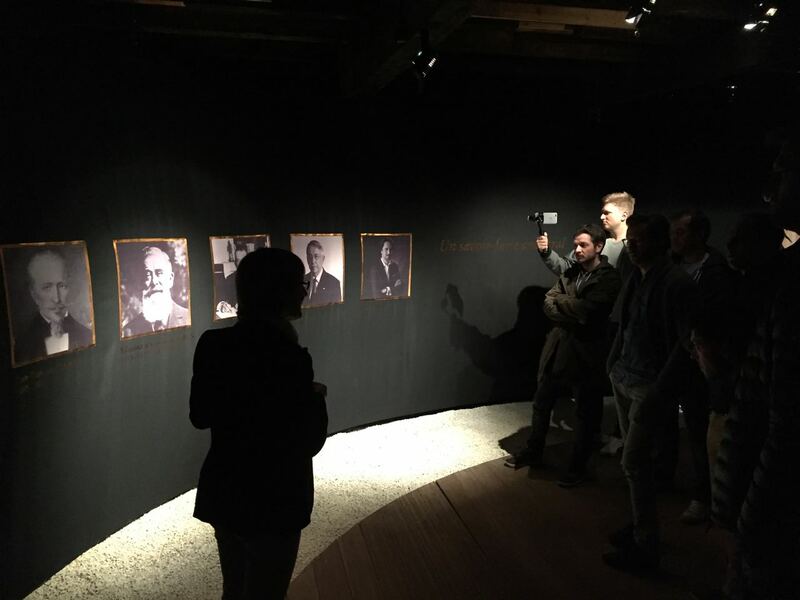 Find out more information about Camus Cognac, including visiting the house and taking part in a tour.